Skills have always been an important part of The Elder Scrolls games. They determine how well your character can use various weapons, magics and items in the game, with higher skill levels providing bonuses. Unlike many RPGs, skills in Skyrim are not obtained by spending experience points. Instead, skills increase automatically by your use of them. If you use a one-handed sword, for example, your use of that weapon will increase your one-handed skill. In-game notifications let you know when a skill has increased. There are 18 skills in Skyrim, lumped into 3 groups – Combat, Magic and Stealth. The groups are actually important, because early in the game you'll find a set of stones that let you choose one group as your focus. You'll then improve those skills 20% more quickly. 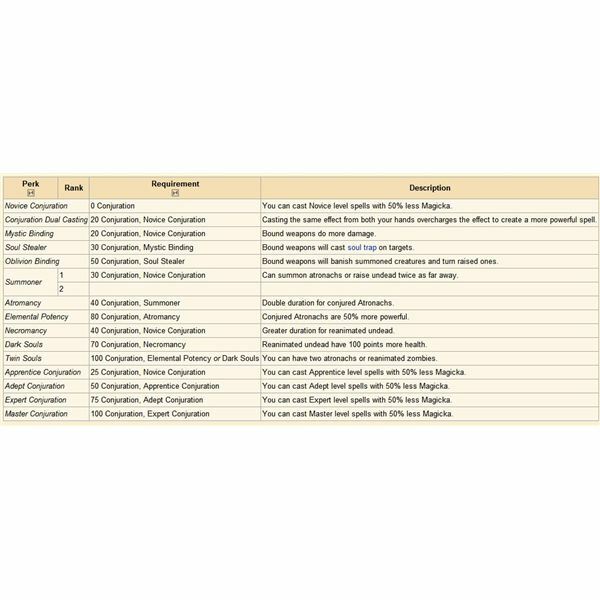 A new featured added to skills in Skyrim is perks. Whenever you level, you receive one perk point, which can be invested into a skill perk. However, access to perks is limited by your level of skill. You can't access a high-level perk related to the Heavy Armor skill if you don't already have a high level of skill with Heavy Armor. 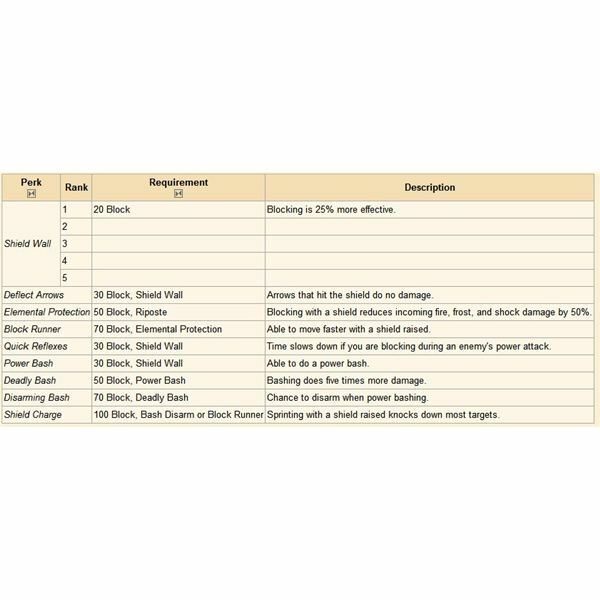 Let's have a look at the purpose of the combat skills, and the perks available. 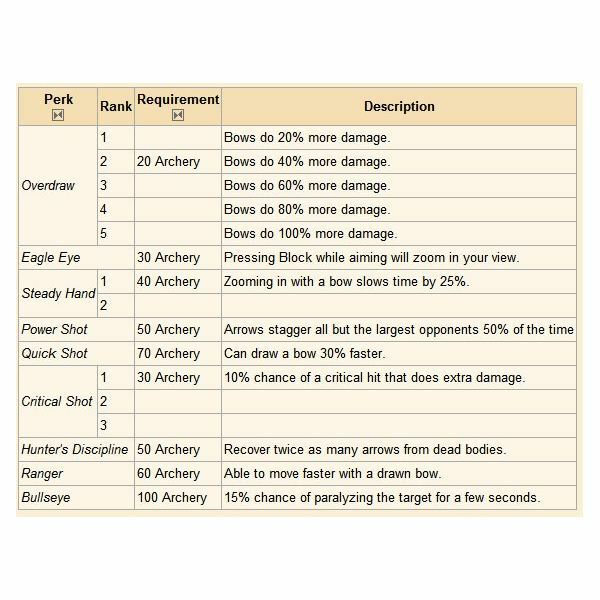 Archery – Higher skill increases damage. There are several interesting perks in this line, the most important of which are probably Eagle Eye (zooms you view while using a bow) and Steady Hand (slows time while zooming). Block: Reduces damage from melee and ranged combat when blocking with a shield. 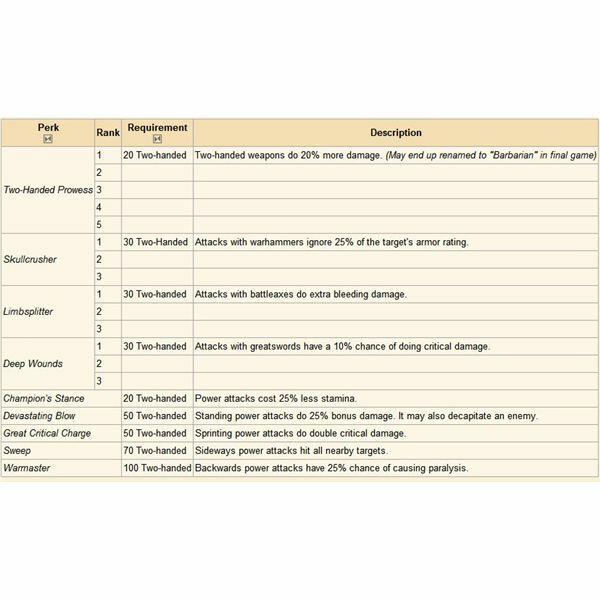 Perhaps the best perks in this line include Elemental Protection, which reduces incoming elemental damage by 50%, and Shield Charge, which knocks down opponents. Heavy Armor: Reduces damage taken while wearing Heavy Armor. 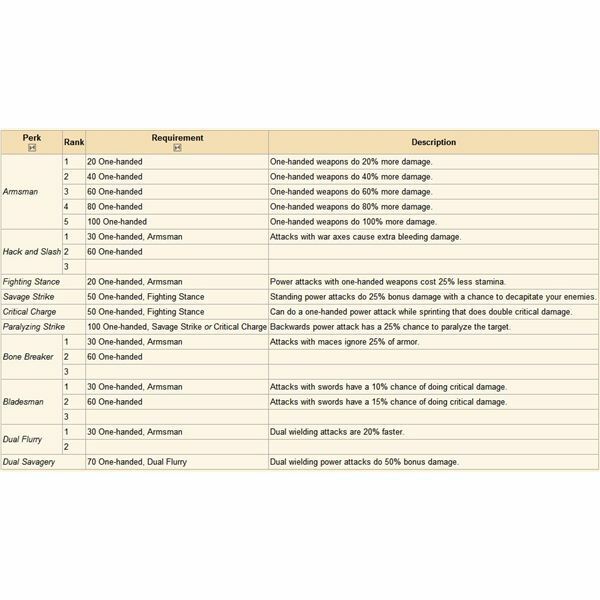 One of the best choices here is the top-level perk Reflect Bows, which reflects 10% of all melee damage taken back on the attacker. One-Handed: Increase damage done with one-handed weapons. This includes one-handed/shield and dual-wielding combos. Dual-wield has its own, smaller perk tree, and there are several weapon-specific perks in this skill group. 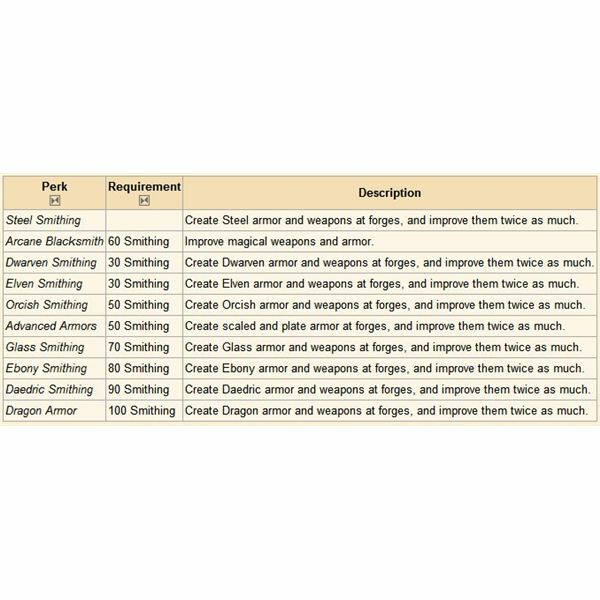 Smithing: This is a crafting skill that allows for the creation and improvement of weapons and armor. A higher skill level is required to create better items. Two-Handed: Increases damage done with two-handed weapons. There are several weapon-specific perks, and at skill level 70 you can access Sweep, a multi-target forward attack. 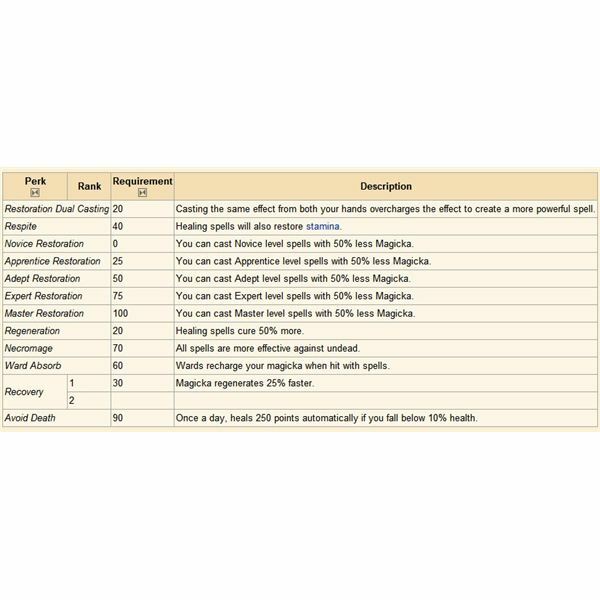 Now let's have a look at the skills and perks related to magic. Alteration: This school of magic is about manipulating the physical world. It includes some magical protection spells and many utility spells. 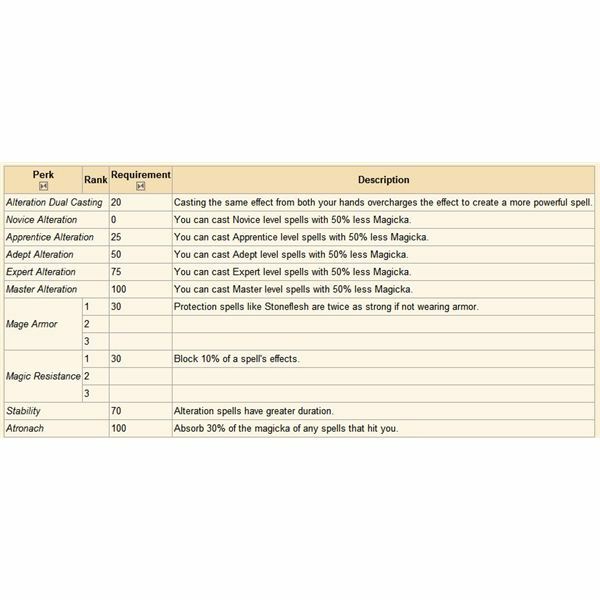 At skill level 100, you can access a very handy perk that absorbs magic from spells that hit you, much like the Breton's Dragonskin racial ability. Conjuration: This spell skill is all about creating magical items and summoning or raising creatures. 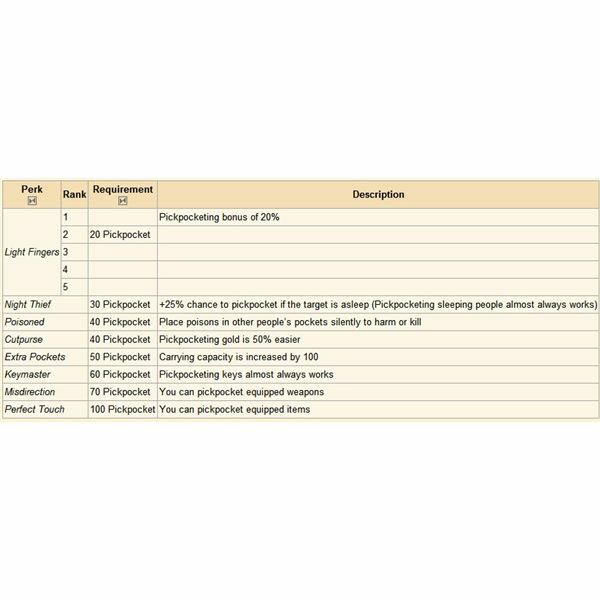 It contains the pet spells and also allows for the creation of magical "bound" weapons. Many of the perks increase the strength of summoned creatures. 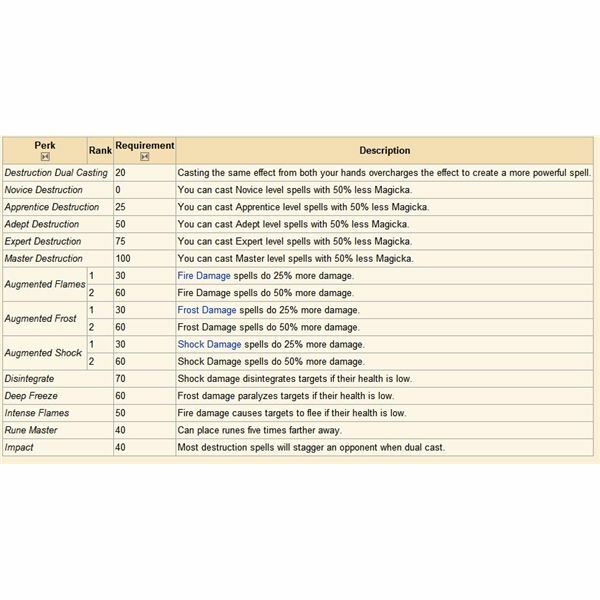 Destruction: This is the straight-up damage dealing tree of magic. It is based on elemental forces like fire and frost. The perks are, frankly, a bit boring, though the paralyze effect available for frost spells is nice. 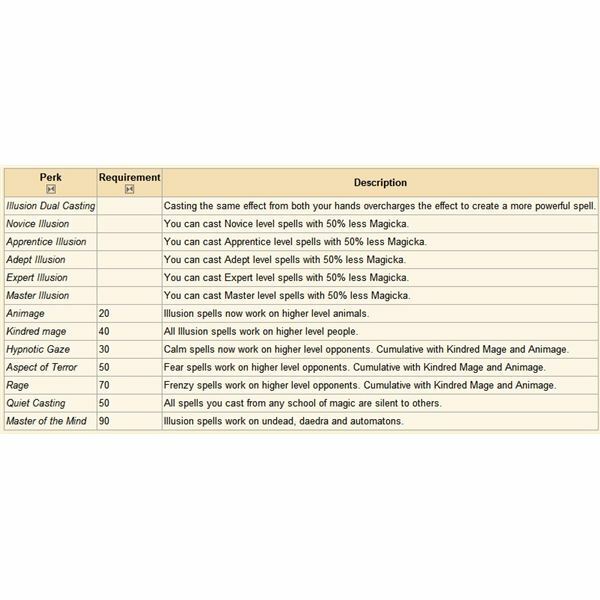 Enchanting: This magical skill is about adding magic effects to weapons and armor; it's the crafting skill of the magic group. 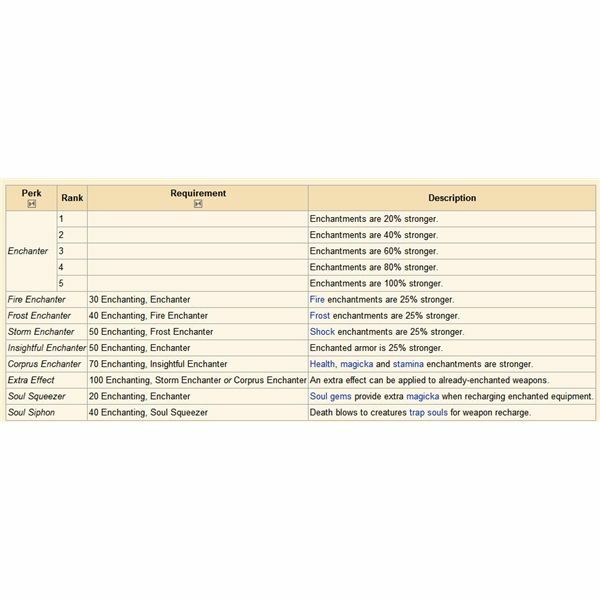 The perks allow for the crafting of better enchants. Illusion: This skill allows for the creation of magical deceptions and illusions. It's where you'll find the game's fear and charm spells. One really cool perk, available at 50 skill, is Quiet Casting. This makes all of your spells silent–excellent for mage/thief characters! Restoration: This is where the healing spells reside, as well as some cleric-like magical abilities such as Turn Undead. The perks are a bit boring except for Avoid Death, available at 90 skill. This perk automatically heals you for 250 health if you fall below 10% health. Theives and warriors who are interested in surprising opponents will want to consider skills in the stealth group. 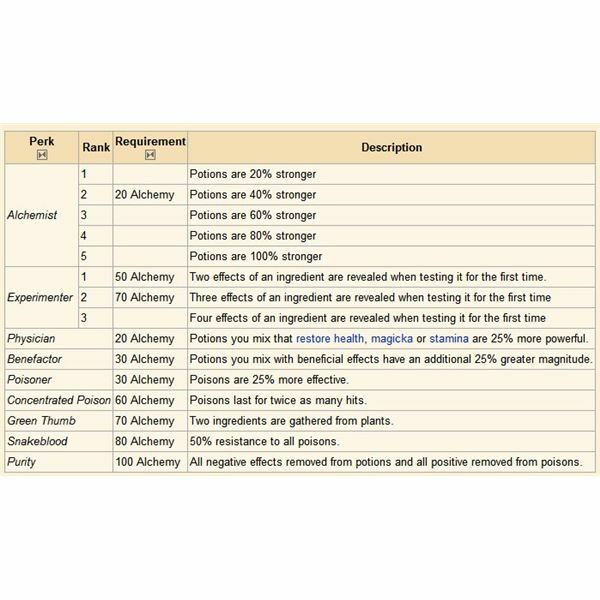 Alchemy: The craft skill for this group, Alchemy is used to brew potions and poisons. The perks are bland and uninteresting, but have nice bonuses. Although this is part of the stealth group, warriors should also find alchemy useful as a means of supplying themselves with health potions. Light Armor: Like Heavy Armor, increases this skill reduces damage taken. The perks are a bit different, however. 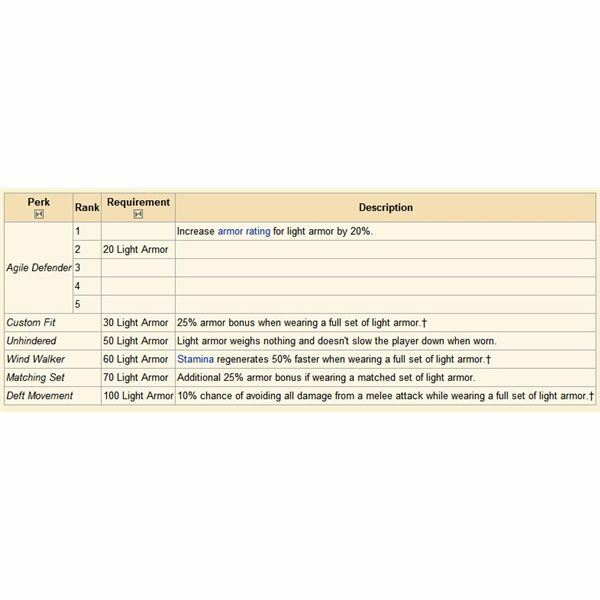 For example, the 100 skill perk Deft Movement offers a 10% chance of avoiding all damage from any melee attack when wearing a set of light armor. Lockpicking: Used to pick locks on chests and doors. A higher skill level makes it easier to pick locks without breaking lockpicks. In addition, the skill includes perks that make it much easier to pick the hardest locks in the game. Pickpocket: This skill lets you take items directly off a non-player character. One of the more interesting perks is available at skill level 40, and lets poison a character silently. The skill level 100 perk Perfect Touch lets you steal items that are currently equipped. You can literally take the sword from the hands of a guard. 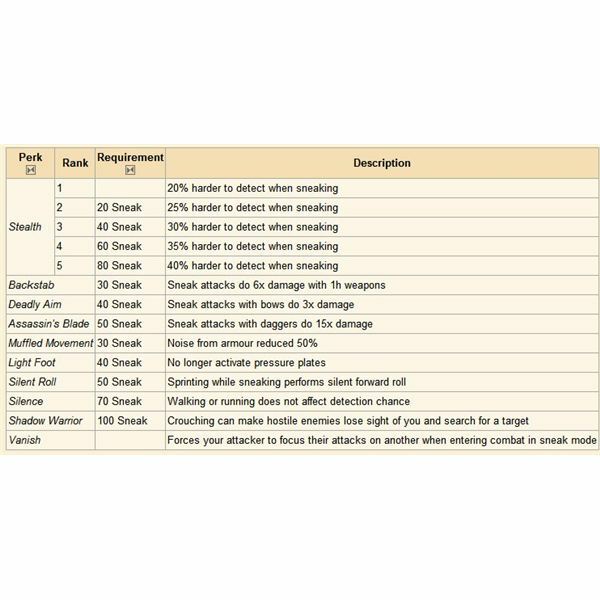 Sneak: This is the stealth skill, which allows you to move undetected and attack opponents with the element of surprise, which provides bonus damage. At skill level 70, you can take the Silence perk, which gives you the ability to walk or run without impacting the chance you will be detected. 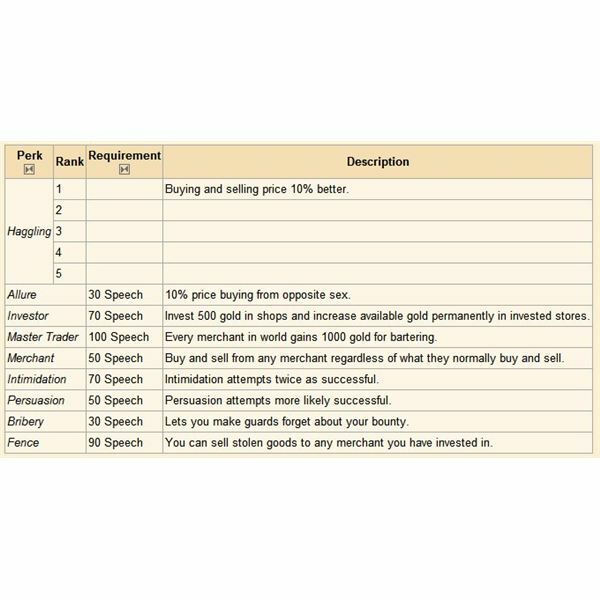 Speech: This lets you persuade non-player characters, including merchants. A higher skill improves the deals you'll receive during trade and also improves your chances in situations where you have the opportunity to persuade or intimidate. One of the more interesting perks, available at just skill level 30, is Bribery – it lets you make guards forget that you have a bounty. Understanding the skills above will make it much easier to plan your charcter in Elder Scrolls: Skyrim. If you have any questions, feel free to ask them in the comments. A guide to Skyrim skills and leveling up.